House or art gallery? You decide. Jess Goehring and Nathan See are as intentional about their home as they are about their work. Both artists (See primarily works with sculpture, while Goehring focuses on artistic photography), they consider art and furniture undeniably inseparably. But, then again, so are they. 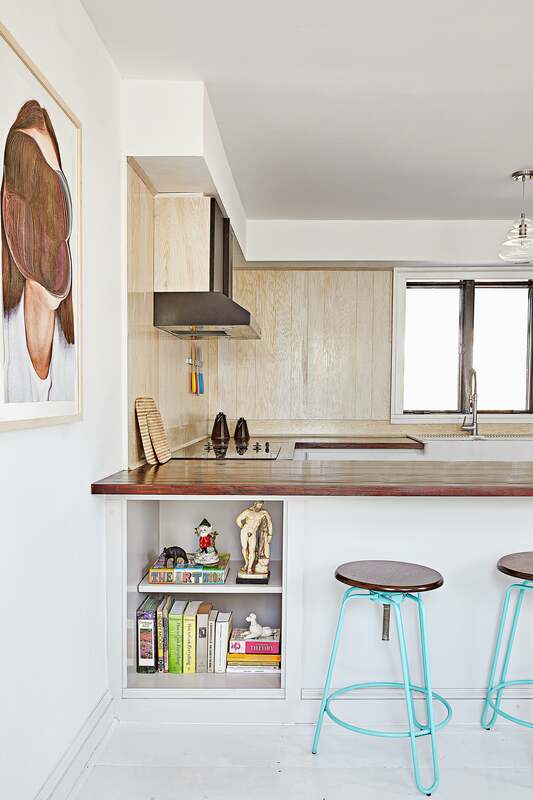 While their individual creations couldn’t be more different, their three-bedroom home in Hudson, NY was a collaborative effort. Using each of their skill sets to their advantage, the couple approached the 1860s eyebrow colonial methodically: Jess taking the lead on color, texture, and depth; Nathan bringing his eye for form and structure. The result? A show stopping original. “Or a knife,” laughs Goehring. Together, the pair design and fabricate furniture, operating under the guise of See by Design. The living room coffee table—a white laminate slab that’s been cut to look like a traditional live edge—is a prime example of the couple’s joint aesthetic. Aside from a handful of mid-century pieces, almost every item of furniture in the home is an original. This shared understanding informed the design of their home. Ahead, the artist duo looks back on what it was like to join forces on their biggest project yet. Jess: And, we knew a lot of artists were moving up to the Hudson Valley and Germantown area. We started looking for studio spaces here and it was extremely affordable. Nathan: [The interior] was easy for us. When we bought the house, it had a 1970s aesthetic. We had to gut it. The house just didn’t feel like it was keeping with the original style. We knew that we wanted to turn it back into something that felt comfortable and old. Jess: It’s a smaller house so we really decided to keep most of it white. The living room, the kitchen, the bedroom, the hallway upstairs… we kept all of those spaces white to make it feel a little bit bigger. Then, we decided to do pops of colors in different rooms. In the hallway, we ended up doing a turquoise. It helps to separate the white living room and kitchen. Nathan: It made it feel like a different area. It’s a transitional space, so you want it to feel different than just the rest of the house. As much as I’m totally for living in a white house (I say that because I’m horrible with color and am envious of anyone who does a solid red living room), this color makes you feel happy. It’s like you’re a foot under the water in the ocean floating on your back. Nathan: Because it’s an old house, it had really low, aggressive ceilings. So we vaulted the space. When you walk down the hallway, you still have the low, original ceiling, but when you open the door to the bedroom, it vaults up to like 12 feet. It’s a transformative experience. We always like it when there’s something that’s not expected. And, as a bedroom, you want it to feel special. Jess: I think that we thought about the kitchen the most. We went over so many ideas. At first we thought about going more modern and clean and white, but we really wanted to make [it feel] like a modern country kitchen. Nathan: It was important to us not to go with trends. Like, subway tile—we tried to go as far away from that as possible. Jess came up with this new take on beadboard. She came up with the whitewashed oak as the backsplash to make it contemporary, but also feel old. It feels like tiled wood, but it’s totally different and old fashioned. For the wood counters, we wanted to make a countertop that looked like it was old slabs of wood, rather than [go with] a generic marble. We wanted it to feel more like furniture, like it could still feel like it could possibly have 1% of history in it. It’s translation. It’s not meant to be old, but it’s also not supposed to be brand new. On their next big project…. Nathan: We’re actually going to be moving out of the house! We’re moving to LA and are excited to focus more on the domestic and less on house renovations. This is our third house that we’ve worked on in the last six years, so we’re just kind of worn out. I think as artists, you want to keep transforming. It’s sad and bittersweet when your house is finished, but then at the same time you’re like, “Well, what’s the next project?” Of course, I say this now. Who knows, in the next six months we could be working on something in Joshua tree! Want a See by Design original for yourself? You can keep up with the couple’s latest creations on Instagram.